We were to become “Partners” with Sandwell Metropolitan Council initially winning a contract for an eighteen month trial Pilot Scheme for all demolition within the Metropolitan Borough area. So successful was the Partnership cost savings for Sandwell that a further contract for a five year period was later secured. The works consisted of all the demolition works that would normally have been tendered. 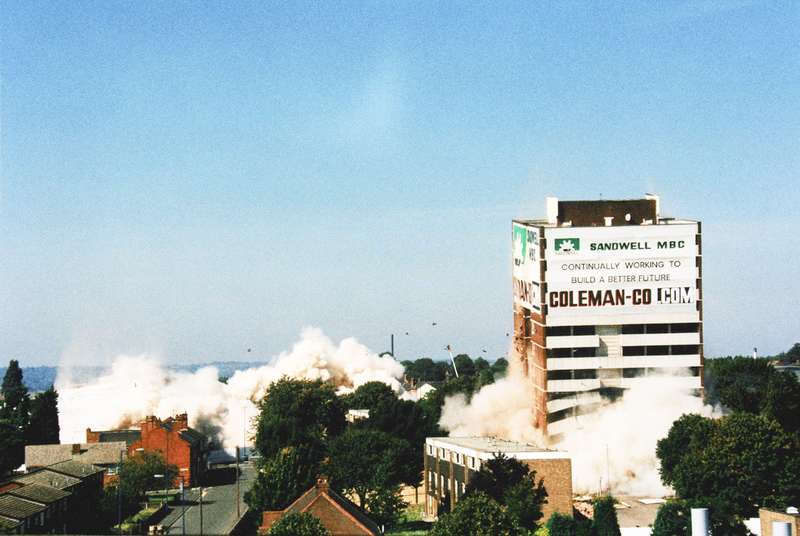 Sandwell had the benefit of the services of an award winning demolition contractor at its disposal, site turnaround time was greatly reduced, the Council were not at risk of buildings that had been vacated being illegally occupied and/or stripped, resulting in loss of value, therefore loss of credit. We were happy to be of continued service. The work was plentiful and varied enormously requiring a wide and varied range of talents, both physical and mechanical! 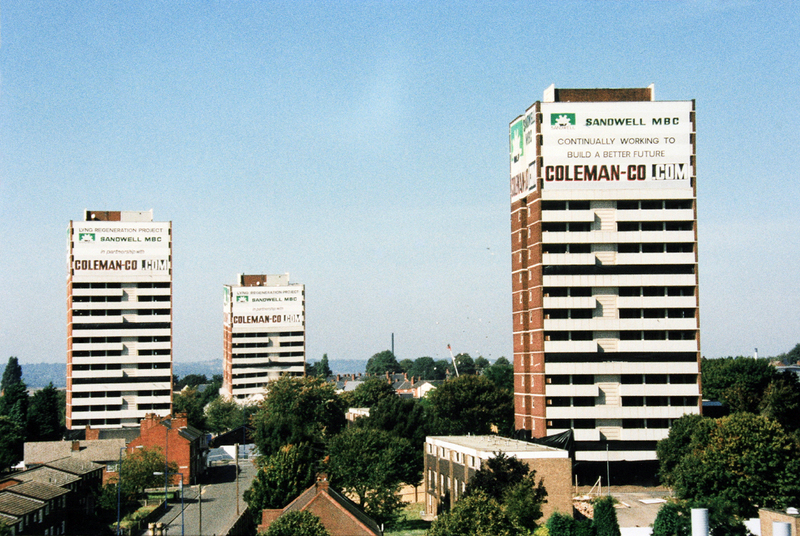 There were explosive demolitions, complex demolition debuilds and tower block demolition to name a few. The demolition spanned residential demolition and commercial demolition. Foundation removals, land reclamation, land remediation, Site Security were all part of the Scope of Works. 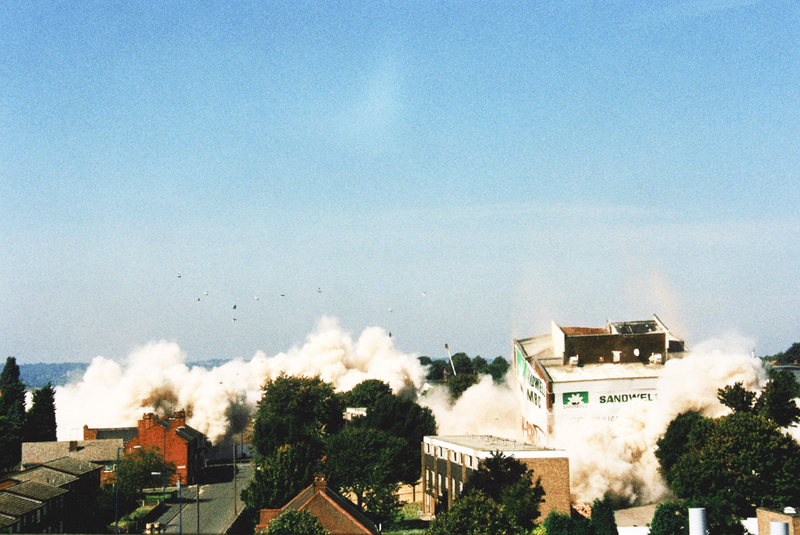 Triple explosive demolition Lyng Estate West Bromwich….now you see it….. Following on from Michael’s decision to leave the business at the end of September 2002, it was with sadness that Maureen decided to retire from the company at the end of December 2003. So now it was down to me and Mark to continue what my parents started all those years ago. Explosive demolitions were becoming more frequent, our stature, confidence and competence grew with each project. No two explosive demolitions were the same. Each structure seemed to have its own character and its own independent challenges therefore complacency was not a description of the attitude that was to be used within the Coleman criteria. We were becoming increasingly aware of where many hidden hazards and dangers lay in wait, such as services through or below the building, use of asbestos as insulation, as fire breaks, in plumbing, as packing to floors, even as decorations. These really helped us establish ourselves as technical demolition experts. 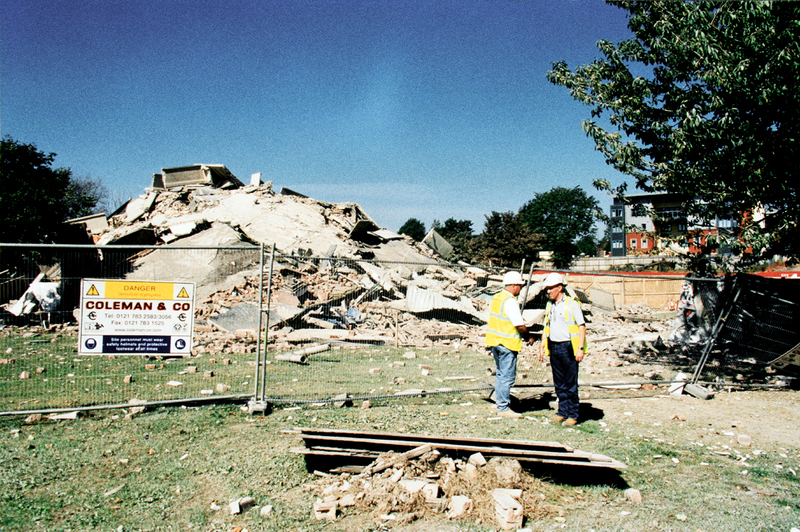 Once “soft stripped”, all non load bearing walls were removed from blast levels, solid concrete walls were drilled at strategic points, the holes could be upto two metres in depth, these were required to take the explosive charges. The drilling presented a Health & Safety issue, due to the level of vibrations that were emitted from the hand drills into the operatives. We set about finding an answer to this problem; we purchased a `Mini` excavator small enough to travel through the doorways of the flats, light enough to be carried by the floors. We then bought a `Mini` drilling rig, we designed and built a special carrier bracket to couple the two, allowing full rotation of the drill on the rig. At first we encountered stability problems with the mini excavator, as the drill rig assembly was too heavy and powerful for the Mini Excavator to handle, but adjustments to the excavator geometry, and added ballast soon rectified this problem. Our hand, arm vibration problem was a thing of the past, we had developed a piece of equipment that carried a drill, that could drill at any angle and be remotely operated by one operative, vibration free, the drilling times and costs were also greatly reduced. Cobden House, Chatsworth House, Ryder House, Princethorpe House, Cheshire House, Chillinghome Tower, Haddon Tower, Donnay House, Nettleton House, Beattie House, Jellicoe House three blocks on the Lyng Estate and Edgbaston Galleries were some of the local substantial land mark buildings that were to collapse into a pile of debris with a series of loud bangs, in a cloud of dust. Ugly blocks at Riverford Road, Shawbridge Street and Octavia Court Glasgow. Fala, Garvald and Sutra House Edinburgh also met with the same fate. 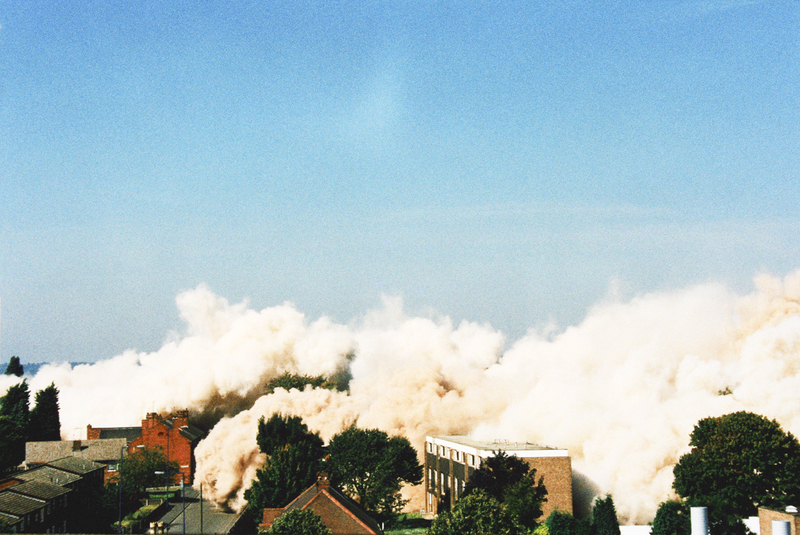 To learn more about our broad range of specialist, complex, industrial, explosive or high reach demolition click here.